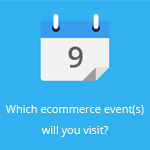 September 26, 2014 by Ecommerce News. About Statistics with tags Denmark, Finland, Norway, Sweden. 4669 views. Bring, a Norwegian postal and logistics company that’s owned by Posten Norge, has taken a look at the ecommerce industry in the Nordic region. This year’s report shows that the consumers’ total experience is important when shopping online. 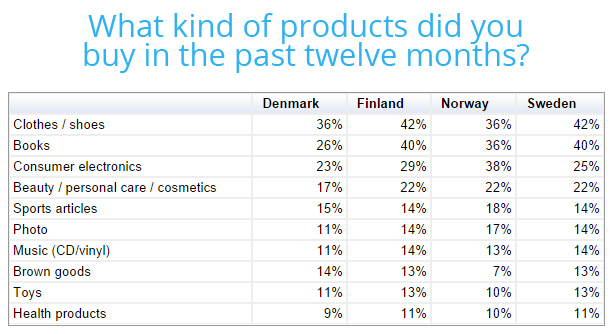 And it also shows that there are some big differences between consumers from Denmark, Sweden, Norway and Finland. Danes and Swedes for example, are more interested in the opportunity to get their products delivered to their homes, while Norwegians and Finns are less concerned about comparing prices than their Nordic neighbors. These findings and more can be found in the latest ‘E-handelsrapporten’. The researchers asked how important certain factors were for consumers in these four Nordic countries. Safety was the most important, for all correspondents. Good delivery options were also important, but mostly for Danish consumers (69%). Finnish, Norwegian and Swedish consumers also care about good delivery options, but they put more value in easy payment solutions and good product information and images. 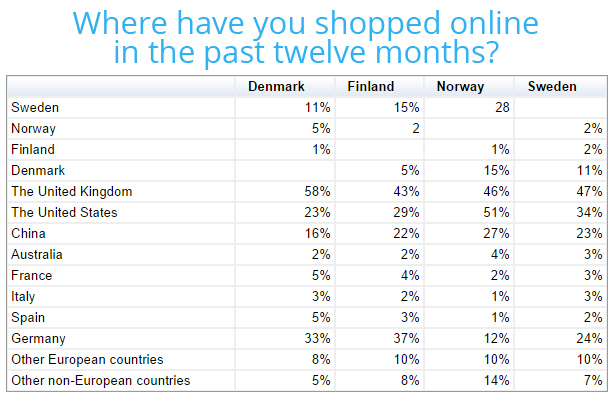 Another interesting finding is that 40% of the Finnish consumers think it’s important an online store doesn’t require consumers to login, in other Nordic countries these percentages are way lower (21%, 23% and 24%). Slightly more than one in five Danish consumers (21%) answered ‘yes’, when they were being asked if they shop online at least once a month. This percentage is the highest in the region, as Finnish (15%), Norwegian (18%) and Swedish (20%) have less frequent online shoppers. Bring also asked its respondents what kind of items they have bought online in the last twelve months. It seems all nationalities like to shop online for clothes and shoes, books and household items. 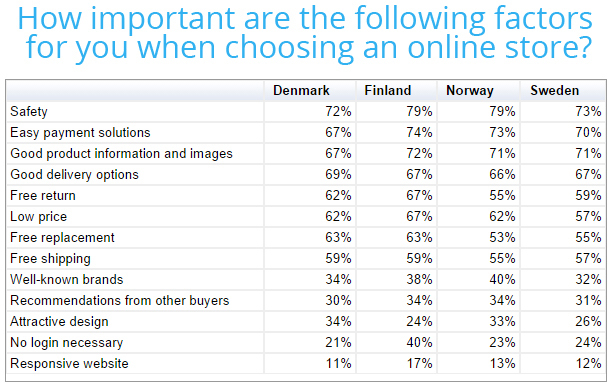 More than four in ten consumers from Finland (46%), Norway (41%) and Sweden (46%) use search engines to orient themselves before they choose the products they buy online. In Denmark however, this percentage is with 32% significantly lower. Finnish consumers hardly look at mentions in newspapers or magazines, as only 3% said they did this in the orientating phase. When asked what’s the downside of shopping online, half of Finnish correspondents said it’s hard to find the right size online, while a lot of people (42%) also don’t like the fact they need to register on a website before they can shop online. In Denmark most people are unsure if they can return their bought goods. Another interesting to look at, is which payment methods are the most popular in Denmark, Finland, Norway and Sweden. In all four countries credit/debit card payments are still the most popular payment method, except for Finland that prefers online banking. In Denmark 89% of consumers pay by using a credit card or debit card, while these percentages are way lower in Norway (57%) and Sweden (38%). In Norway, micro payments are surprisingly popular as 13% of the respondents have paid their goods this way. In the other Nordic countries this payment method is in no way that popular. There are still few people in the Nordics who shop online using their smartphone (DK: 4%, FI: 4%, NO: 5%, SE: 6%), so the researchers asked what it will take for them to buy more online using their smartphone. 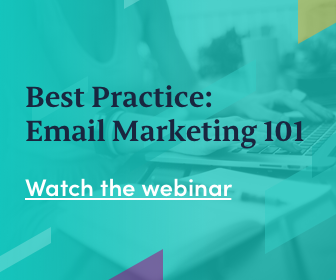 Most respondents said they want the websites to be better optimized for mobile browsing. Many people also wanted better navigation, better payment methods and an easier purchase process. When looking at the report, it shows that Denmark apparently isn’t a country where collecting goods is popular, as only 38% of respondents chose this option during their last purchase. In Norway (61%) and Sweden (59%) this delivery option is far more popular. In Denmark on the other hand, consumers like their goods to be delivered at their homes.